Mr Monkey made a number of bus rides to get into the centre of Manchester. After visiting the Christmas Markets in various places he scampered along to the Royal Exchange Theatre for the press night of Sweet Charity. Sweet Charity was written by Neil Simon in 1966, who based it on the screenplay of Federico Fellini's film Le Notti di Cabiria which won the Academy Award for Best Foreign Language Film in 1957. Music was written by Cy Coleman and the original Broadway production was choreographed by Bob Fosse. This musical gave the world the songs Big Spender and The Rhythm of Life; Mr Monkey hadn't even realised either of them were from musicals, let alone the same one. 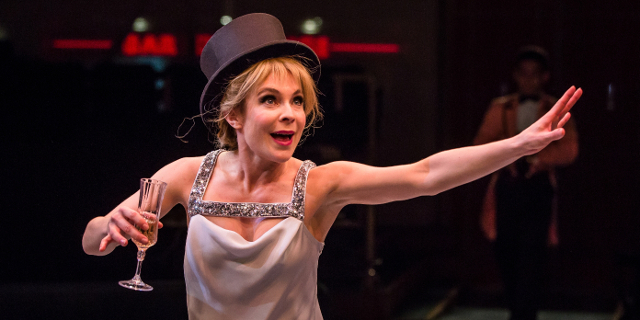 Sweet Charity tells the story of Charity Hope Valentine attempts to improve her lot in early Sixties New York. She is working in a sleazy dance club called the Fandango, the most idealistic and optimistic of a group of cynical and bitter women. Her search for love and marriage (it's early enough in the sixties that she doesn't want one without the other) leads her into a series of strange encounters ranging from being pushed into a lake to attending a hippie church gathering via hiding under an Italian film star's bed and being trapped in a lift with an accountant who should never have got in the lift in the first place. The set is simple - a plain floor with lines that can be illuminated, with furniture and fittings wheeled on and off as necessary. Part of the seating has been removed to make room for the live brass band who provide the music throughout the show. Being able to see the band added a lot to Mr Monkey's enjoyment. Kaisa Hammarlund is excellent as Charity Valentine, wonderfully optimistic and perky even when she's crossing the stage under a hostess trolley. She's supported by an excellent cast, most of whom play multiple parts. 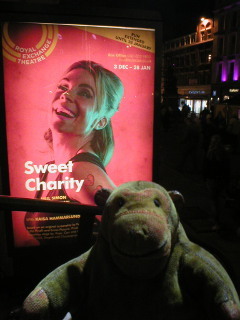 Mr Monkey found some parts of Sweet Charity a little dated, particularly in its attitudes to women but only really worried about it on the bus home; during the performance everything is uproariously funny. The dance routines are all wonderful, using all the space available on the Exchange stage. Mr Monkey throughly enjoyed this production, and recommends it to anyone who fancies an evening of raucous entertainment but doesn't mind some slightly outdated attitudes. 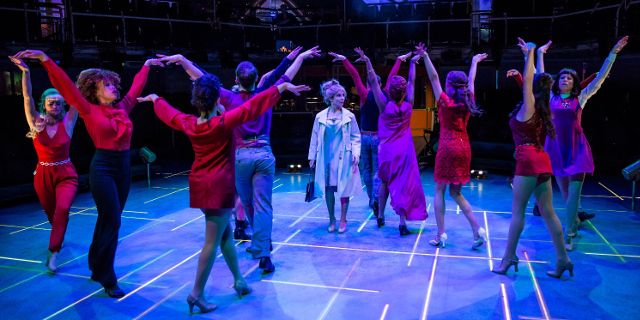 Sweet Charity runs until 28th January 2017.